Functioning on the automatic movement with bi-compax chronograph, the new watch series, part of the Silverstone collection, is presented in specific colors inherent in a vintage style. The company Graham with a new watch recaptures the feel of the legendary classic races spirit that combine continuously developing automotive technology and precise timepieces. In the late 19th century, the unbridled passion to the mechanisms led engineers to create a car running on gasoline, and to organize the race on them. Technical development has become a priority feature for riders of those generations. The new Silverstone Vintage 30 watch reflects the creative and competitive spirit of the time, being a standard of reliability, durability and accuracy. The novelty is designed with the same care with which were created machines, and through exterior design of the model Silverstone Vintage 30 the company Graham expressed its respect for all enthusiasts, dedicated to racing and mechanisms. The Silverstone Vintage 30 watch is available in two versions: ref. 2BLFS.B36A with a black dial and ref. 2BLFS.W06A with an off-white dial. The novelty lies in a 47-millimeter stainless steel case, the front of which is fitted by a double anti-reflective convex sapphire crystal. On the back cover is also set a sapphire crystal. The bezel is decorated with Clous de Paris ornament. Dial markings are made by large Arabic numerals. The square aperture of the date is located at the 7 o’clock position. The model operates on a manufacturing caliber G1734, assembled by 27 jewels and possessing the carrying frequency of 28,800 vibrations per hour. Reserve of the caliber is 48 hours. Incabloc antishock absorber modifies the mechanism. The watch water-resistant - 50 meters. The watch comes on an integrated into the body a leather strap in light brown. 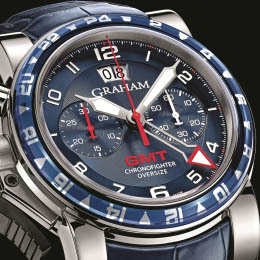 To buy the Silverstone Vintage 30 watch will be available through the official representatives of Graham.